Described by Road & Track magazine, July 1958 as ‘a sports car of Herculean size and strength’, Bugatti’s Type 50 built on the characteristics of its sibling, the luxurious Type 46. Almost double the price of the Type 46, it seems a little surprising that the Type 50’s engine, although largely the same as the Type 46, was actually reduced in capacity. 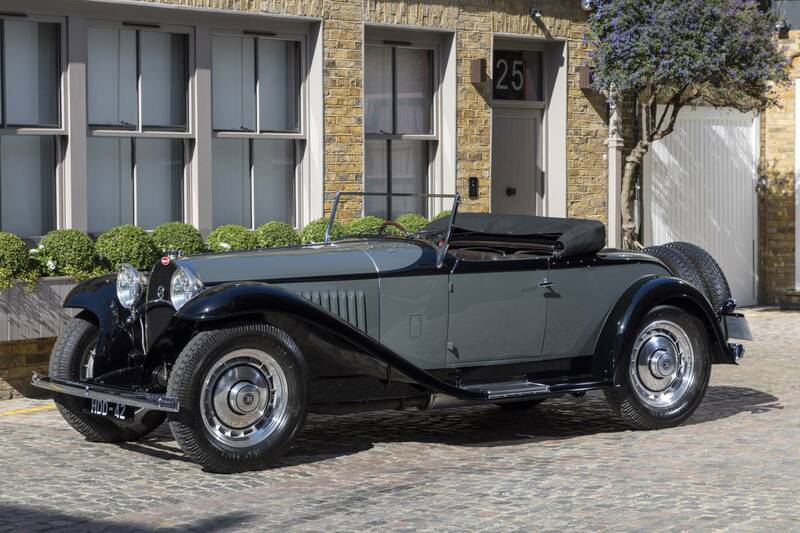 However, this was for a very good reason as it allowed for a twin-cam set up which empowered the Type 50 to reach high enough revs per minute to achieve 200 brake horsepower; truly remarkable for its time! As one would expect for such an important car in Bugatti’s portfolio, only the best body options were offered and fitted to the Type 50. This Bugatti, 50123, was fitted with roadster coachwork designed and built by Bugatti in its Molsheim factory. As such, it is one of only four Type 50s to be clothed in Bugatti’s roadster coachwork in period and is one of just two surviving examples. 50123’s first owner was the famous artist Monsieur André Derain of Paris, although by 1935 the Bugatti had returned to Alsace and into the hands of its second owner, Jean Trivier who was the owner of a large brewery in the Vosges. In June 1937, 50123 crossed the channel to England to be with its new owner, Jack Lemon Burton. Burton used the Bugatti as his personal transport until the outbreak of war in 1939. In 1942, Burton sold 50123’s engine to American Eri Richardson to replace the damaged engine in Richardson’s Type 46 but after the war Burton installed another Type 50 engine into 50123, which he had acquired from France, returning the Bugatti to factory specification once again. 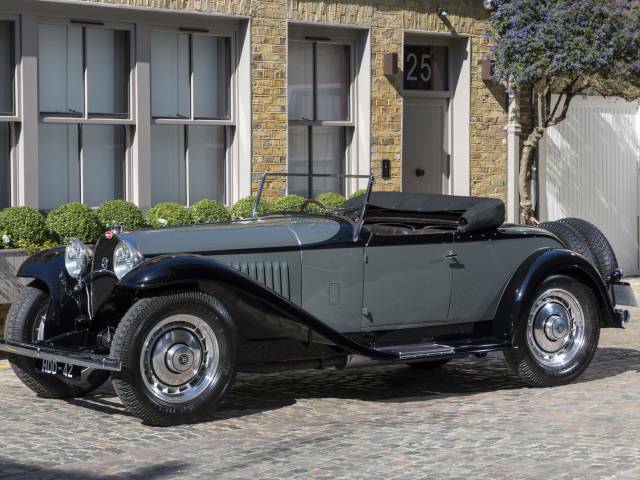 The Type 50’s next owner was John C Erskine-Hill of South Kensington in whose name it was listed in the 1954 Bugatti Book by Eaglesfield and Hamton which contained the first published register of Bugatti motor cars. Soon after this 50123 was advertised for sale in Motorsport magazine and it was believed that American tyre manufacturer and fabled collector, Ann Klein, subsequently purchased the Bugatti. There followed a continuous American history, with the Bugatti eventually passing to the legendary collection of the late Henry Petronis, who had the Type 50’s chassis and coachwork comprehensively restored by David George, with its mechanical work being overhauled by respected Bugatti and Alfa specialist Chris Laden. The car was last shown publicly by Laden at Pebble Beach in 2010 where it received a second in class award. Its current owner was attracted to the Type 50 rather more for its potential as a strong and powerful road rally car and, as such, has spent considerable time and money with Phil Reilly and Company, really bringing the Type 50 up to its full driving potential, which includes having new wheels recast, along with chassis and shock absorber fine-tuning to get the balance of the Bugatti just right. We at Fiskens can confirm that, having driven 50123, it is all we expected Bugatti’s legendary Type 50 to be; easy to drive with beautiful brakes and steering, accompanied by lots of low-down torque. With its supercharged 5-litre engine, it offers, as one would expect, a wide range of performance! Bugatti Type 50s are rare beasts indeed and the Jean Bugatti-designed roadster coachwork on this one makes it even rarer. The height of both luxury and performance in its day, this was truly a supercar of the era. Accompanied by a full history file and report by renowned Bugatti authority, David Sewell, 50123 would be welcomed at all the best concours, tours and rallies where it is sure to make a glamorous and dashing impression.